From left to right: Joe Silkowski (Phantom MIL/PRO), Bryan and Jaynie Bentz (Bentz Boats), Brice Barnes (Custom Weld Boats), Ian Cummer (Thunder Jet Boats), Janet Bauermeister (U.S. Commercial Service-Spokane), Craig Compeau and Steve Stajkowski (SJX Jet Boats) and Doug Riddle (Riddle Marine). 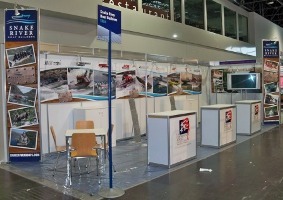 Six participants of the Snake River Boat Builders Export Program exhibited in the Snake River Boat Builders Pavilion at boot Düsseldorf, Düsseldorf, Germany, January 22 – 30, 2011. Participating manufacturers were Bentz Boats, Custom Weld Boats, Phantom MIL/PRO, Riddle Marine, SJX Jet Boats and Thunder Jet Boats. The nine day show included a wide range of exhibitors, importers, agents and consumers from though out Europe. The show encompassed 17 exhibition halls with 1,550 exhibitors and approximately 240,000 attendees from over 50 countries. An estimated 1,700 boat models were displayed. A wide range of water based products were exhibited: power boats, sailing boats; diving; surfing, angling products; boat equipment, marinas and water based excursions. Fifteen “theme worlds” were offered from Beach World to World of Paddling to Blue Holiday World (sailing and motor yachting) to Diving World. 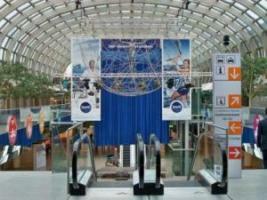 The program had amazing cooperation from the U.S. Commercial Service. Paul Warren-Smith (Frankfurt, Germany) and Klaus Jonas (Düsseldorf, Germany) met the exhibitors at the airport, delivered them to the hotel, helped set-up the booth, arranged appointments with potential buyers and provided an interpreter. Hannah Kamenetsky (Frankfurt, Germany) and Karel Vantomme (Brussels, Belgium) stopped by for a visit and meet the boat manufacturers. The program participants were hosted by the Düsseldorf Fire Department, where they had the opportunity to tour a fire boat moored on the Rhine River and learn about doing business with a German public agency. The Snake River Boat Builders Pavilion was considered an outstanding success, a great foundation for building the brand and developing the European market. 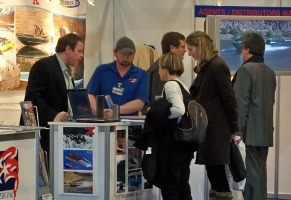 Plans are underway to expand the program’s presence and impact at boot Düsseldorf, 2012.